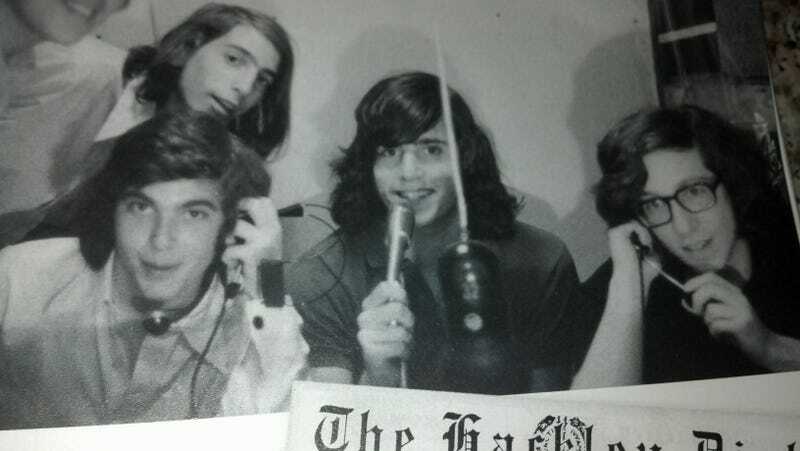 Reader Dan sends along this photo from his father-in-law's high school yearbook—there, in the center holding the microphone, is an 18-year-old Chris Berman. Berman graduated from Hackley School, a prep school in Tarrytown, N.Y., in 1973—just two years ahead of Keith Olbermann. The school had just gone co-ed; when he returned to Hackley to speak in 2010, Berman said "in my class, there were only 12 girls, which made the prom date tough—you really had to scramble." “I loved to learn math here,” Mr. Berman said, recounting his invention of a primitive computer program at Hackley that he would later use to correctly predict the underdog winner of Super Bowl IV. “Who would have guessed, 35 years later I’m the Swami because of that game,” he said. Do yourself a favor and don't watch the video at the top of this page.